A mysterious phone call, a revealed trapdoor, a suspicious red envelope, a missing portrait. 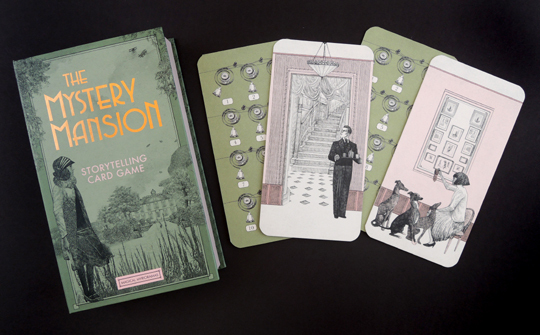 This is the world of “The Mystery Mansion,” a storytelling card game by Magical Myrioramas ($20). 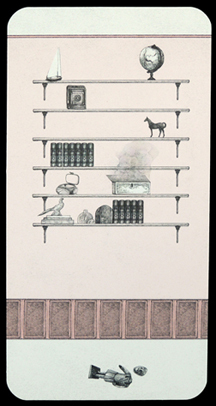 Also known as “endless landscapes,” myriorama cards were popular toys in Europe in the 19th century. 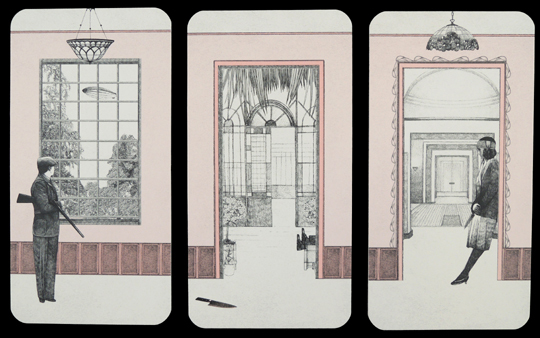 No matter what order you put the cards in, they always line up to create a continuous landscape. You can arrange the cards for visual fun, or you can arrange the cards to tell a story. The Mystery Mansion set has 20 cards, which means there are 2,432,902,008,176,640,000 possible combinations. That’s a lot of mysteries to uncover! The set comes in a neat-o box that opens like a book, with the cards and 2 sets of instructions nestled inside. One set of instructions give short, enticing descriptions of the cards. Example: “He should be a loyal member of the household, but his face belies a bitter grudge…” The second set of instructions repeats the same card descriptions from the first set (which is rather redundant), but it also gives suggestions for various game play. 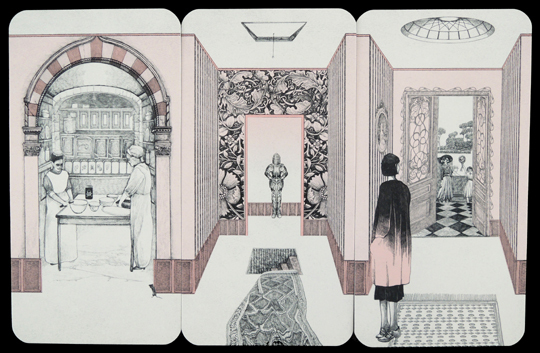 The cards are beautifully illustrated by Lucille Clerc, in a style that reminds me of Edward Gorey. They are printed on heavy card stock, so they’re very sturdy. Here’s my favorite. A bookshelf, of course. There is no suggested age range listed for this product, but my 7 and 9 year-olds played with it quite happily. The dominant color is light pink, but that didn’t seem to bother my son one bit. The theme IS murder, so it might not be an appropriate topic for all kids. But in my opinion, the imagery isn’t too terribly disturbing. Here, in fact, are the 3 most intense cards. Magical Miroramas also has “The Hollow Woods,” which is very Brothers Grimm and graphically speaking, lot more sinister. They are also releasing “The Shadow World” this August, and that looks very cool – all sci-fi and steampunk! This is a really beautiful and interesting set – beautifully illustrated, carefully thought out, nicely printed, and well packaged. It’s highly portable, and who can argue with the potential for endless narratives and stories of your own making? This would make a terrific and unusual gift for a reader or writer. Recommended! 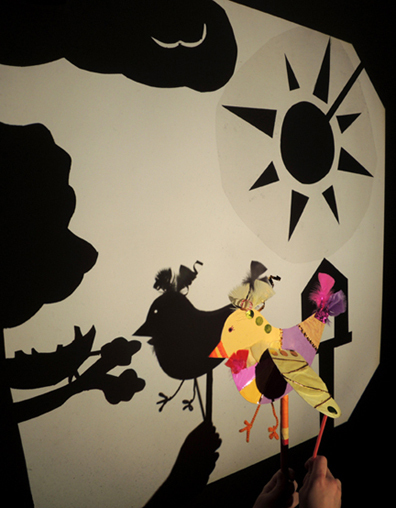 Make a shadow puppet bird, then fly through a story as your narrative appears on the big screen! 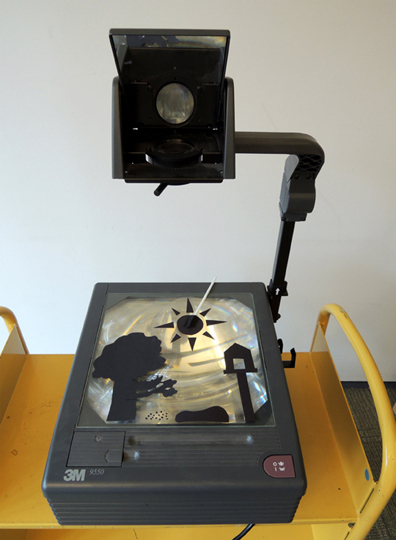 We read Shadows, written by April Pulley Sayre, and illustrated by Harvey Stevenson (Henry Holt, 2002). This beautifully illustrated non-fiction rhyming book examines the various shadows two children find at places like the beach, tall grass, a baseball game, and a creek. The rhymes are lovely and lyrical. 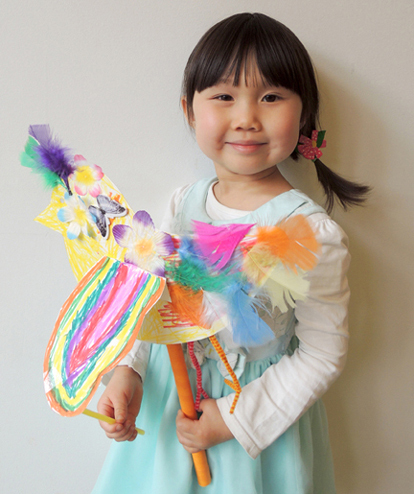 One of my favorites is “Dragonfly shadows zip and pop / Running horse shadows never stop.” Lovely! The construction of the bird is very simple (in fact, if you want to make a smaller version, check out this post). Trace and cut the bird and bird wing templates onto white poster board. 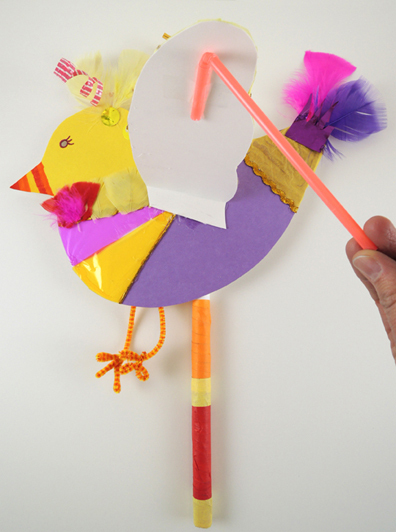 Use a hole punch to create an eye for the bird. Next, decorate your bird (we busted out the Bling Bin and markers for this purpose). To create textures around the edges of the puppet, we also offered craft ties, small feathers, fabric flowers, and paper tissue squares. Twist two pipe cleaners into bird feet, and tape them to the back of the bird’s body. Tab and hot glue the wing to the bird’s body, then tape the short end of a bendy straw to the underside of the wing. The straw is the “stick” that will allow you to flap the bird’s wing up and down. 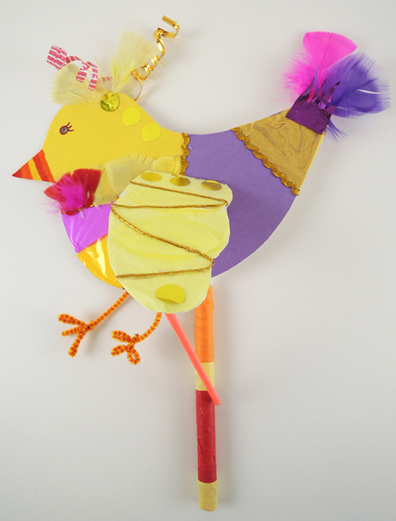 Use packing tape to attach a 12″ piece of PVC pipe to the back of the bird (regular tape isn’t quite strong enough). We wrapped our PVC pipes with color masking tape, but that’s definitely optional. Your bird is done! 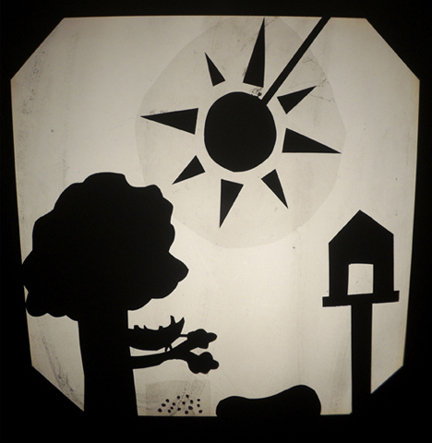 To build the set, Marissa cut a tree, a nest, a lake, and a birdhouse out of black poster board. 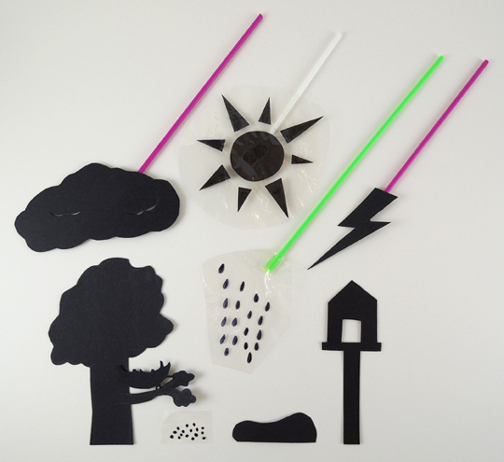 Making the sun was a little more challenging – our initial attempts looked like a giant spider or a vicious super nova. Marissa solved the problem by hot gluing sun rays to a piece of archival mylar (clear cellophane works too). She also used a scrap of mylar to make a sprinkling of birdseed on the ground. 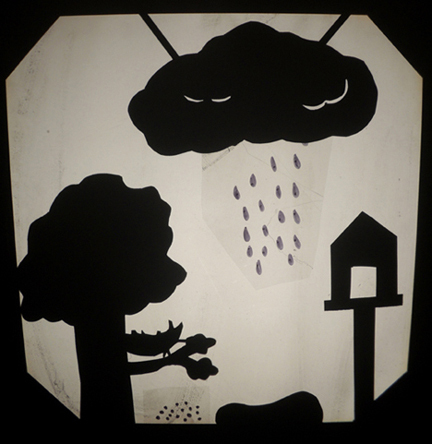 During the shadow puppet story, a storm rolls in, so Marissa also made a cloud, mylar rain, and a thunderbolt. She mounted all the moving set pieces on bits of balloon stick (pencils work too). 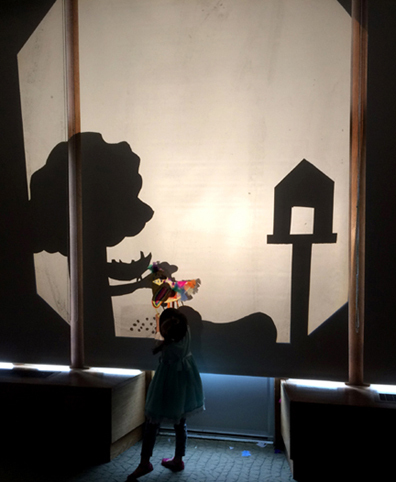 Here’s our lovely puppeteer in action! Ready for a show?